It will be easier to mark tabs with different colors, but I’m a little worried that this menu item is now too eye catching. Please, let me know what do you think. There are 4 text elements in a tab: name, extension, name modification marker and extension modification marker. These elements are normally having the same color. 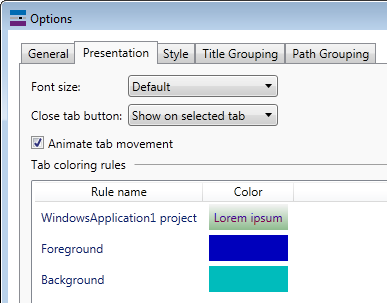 Plus, in Visual Studio 2012, close tab button and open preview tab button are drawings also normally having the same color with the text elements. It is much easier to customize colors for all these elements in the new Tabs Studio version. Let me remind you, that you can start adding a tab coloring rule from two places. 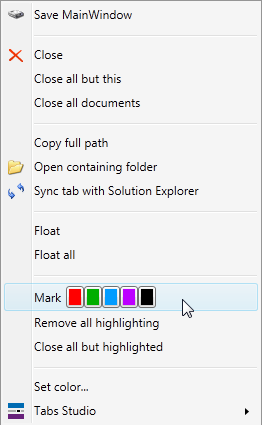 From the tab context menu Set color… command and from the Tabs Studio Presentation options page. In the first case the suggestions will be tailored for the tab you selected to color and in the second case all open tabs appear in the suggestions. Selecting the exact match sets the regex to ^WpfApplication1$ and selecting the Contains option sets the regex to WpfApplication1. 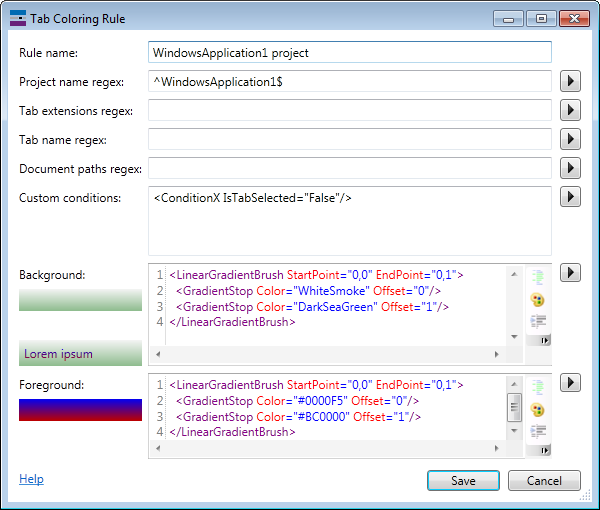 While you rarely have other projects containing selected project name, it shows how easily you can set the regex for example to Wpf and have a distinct color for all your WPF projects. I should clarify that while suggestions are different for one tab and all tabs, the rule created works exactly the same. All that matter is actual text in a regex filed. Coloring by file extension can also be done using Document paths regex, but only with the tab extensions regex you can target tabs like [Design]. Selecting an extension suggestion creates a regex like \.vb \[Design]\$. All special regex characters are automatically escaped (it works for all regex fields). \$ forces exact match on extension end. Tab name regex suggestions work like Project name regex suggestions and Document paths regex suggestions work like Tab extensions regex suggestions. 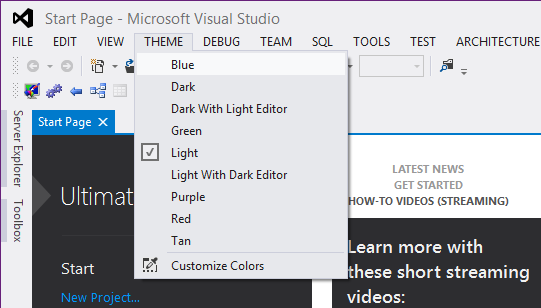 Added support for Visual Studio 2012 color themes. 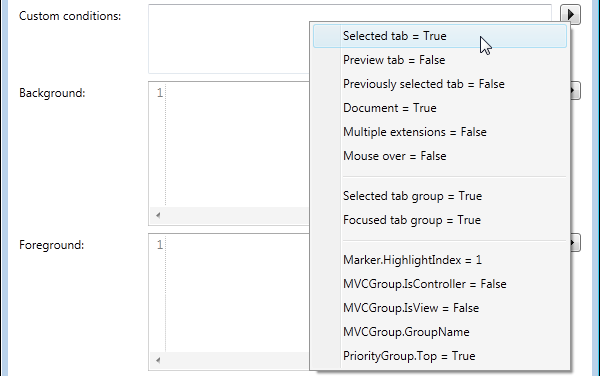 Implemented the right position for the preview tab in Visual Studio 2012. Removed the Tabs Studio restart after saving Add-in Manager settings if the list of startup add-ins has not been changed. Changed the Tabs Studio logo. Download link: Tabs Studio v3.0.0.